Here you will find a full list of Samsung front loading washer error codes. Error or fault codes are shown on your washers display to identify what is wrong with your washer. Error codes also tell you which part may be faulty. 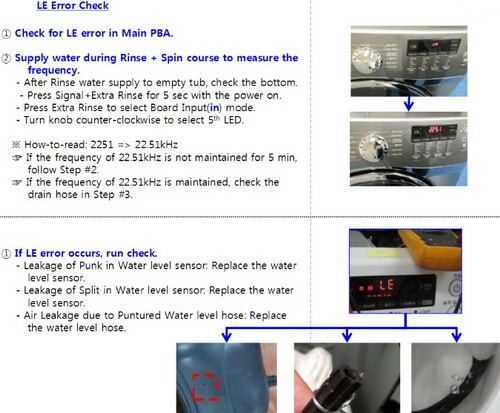 The part needed to repair your Samsung washer for each error code is shown below. 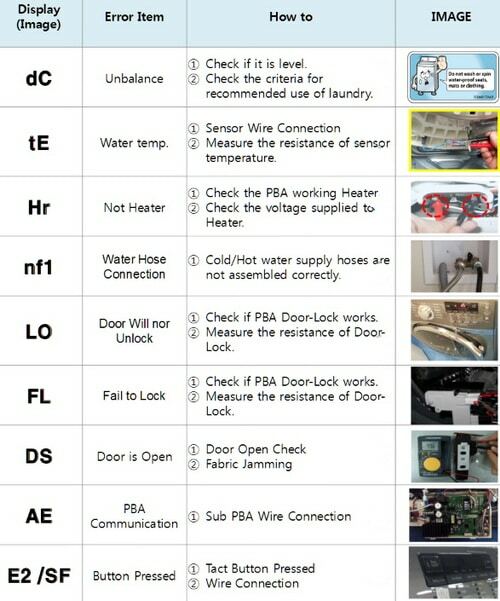 If you have to put the washer into diagnostic mode or need schematics for troubleshooting electrical issues, the diagrams and instructions are below. 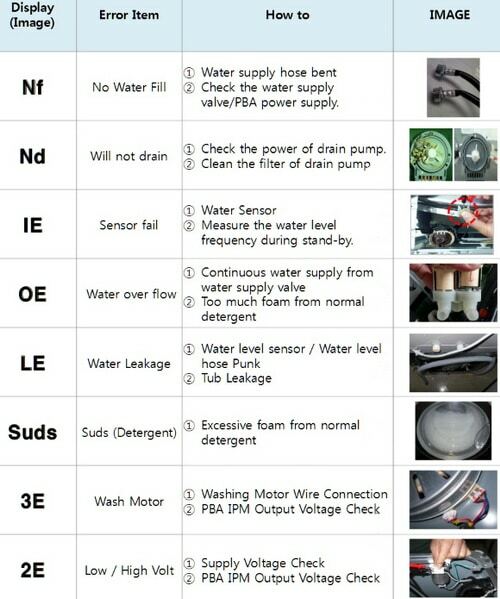 Samsung front load washer error code charts can be found below. Please go further down on this page for more detailed error code troubleshooting. The information below will assist you to find out what has caused the error code to appear on your Samsung front load washer and also the part you need to repair it. If you have any questions or need help understanding and troubleshooting the Samsung washer error code, leave your question/comment at the bottom of this page and we will be more than happy to assist you. Check, Troubleshoot, or Repair: The washer fills for 40 minutes. The water level has not changed after 6 minutes. Be sure the water supply valves for the washer are open. Check the water hoses for bends. Check the water inlet valve. 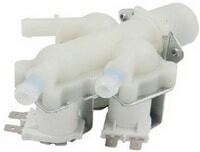 If the valves are found to be faulty then replace the water inlet valves. Check the electrical connection of the water supply inlet valve. Check, Troubleshoot, or Repair: Check the washer drain for blockage. Clean the filter in the drain pump. If the drain pump is faulty then replace it. Check, Troubleshoot, or Repair: The water level drops down below the reset level during the wash and/or rinse cycle. Check that there are no leaks in the washer’s tub. Check the drain system as water can siphon out of the washer if the drain hose is not installed correctly. 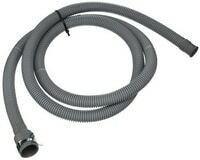 Drain Hose Install Check – Is Drain Hose Installed Correctly? LE error code check – Check for error in Main PBA. Check, Troubleshoot, or Repair: The washing machine has too many suds/bubbles. Do not use an excessive amount of HE laundry detergent. Check, Troubleshoot, or Repair: Remove power from the washer. Check wire harness connection from the water level sensor and main control board. If the connections check good then replace the water level pressure sensor. 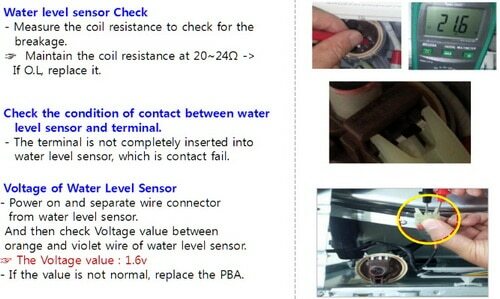 Check the water level sensor – Measure coil resistance for breaks. Check, Troubleshoot, or Repair: Check heating element and thermistor. Check, Troubleshoot, or Repair: Water drain will begin if incorrect water temperature is sensed at the beginning of water supply. 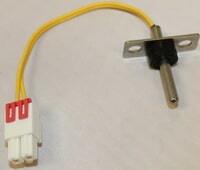 Check thermistor connection and thermistor. Check, Troubleshoot, or Repair: The door does not unlock after 7 tries. Unplug washer and open door. 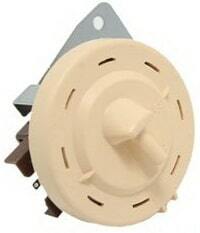 Replace the door lock switch assembly if faulty. Check, Troubleshoot, or Repair: The door does not lock after 7 tries. Unplug washer. Check wiring harness to door lock. If wiring connections are not damaged then replace the door lock assembly. 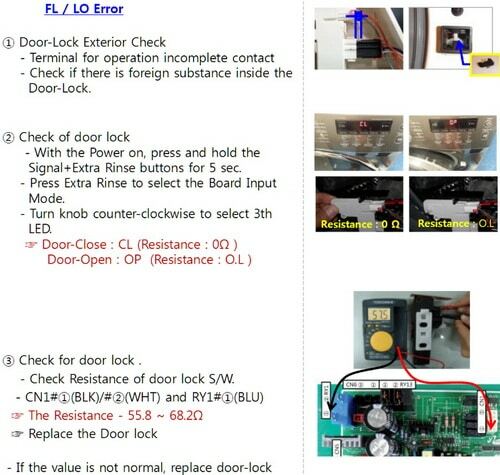 How to check and troubleshoot the door lock assembly. Check, Troubleshoot, or Repair: The water level sensor has detected a water overflow. 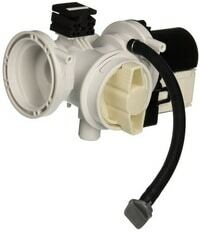 If the washer overfills then check the water inlet valves. 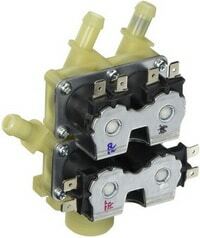 If the valves do not turn off the water flow then replace the water inlet valve assembly. If the washer does not overfill then the water level sensor should be removed and replaced. Check, Troubleshoot, or Repair: The washers load is seen as unbalanced at the final spin cycle. The spin basket will not spin over 150 rpm when the error code is shown. Cancel the spin cycle and redistribute the wash load. Does the washer spin properly after redistribution? If no then check the suspension system. Check, Troubleshoot, or Repair: A key on the control panel is not functioning. If you are unable to get the stuck key freed then replace the user interface board. AKA: Sub PCB control board. Check, Troubleshoot, or Repair: The washer control has detected the washer door is open while trying to lock. Check the door lock switch. If the door lock switch assembly is faulty then replace it. Check, Troubleshoot, or Repair: Check the wire harnesses from the control boards. If the wiring connection is found to be good then replace one of the faulty boards. Check, Troubleshoot, or Repair: Remove power from the washer for 10 minutes to attempt to reset the control board. After 10 minutes plug the washer back in. If the error code comes back then replace the control board. Check, Troubleshoot, or Repair: The heater relay is located on the main control board. Remove power to the washer for 10 minutes to attempt to reset the control board. After 10 minutes plug the washer back in. If the error code comes back then replace the control board. How To Check Heater Voltage for Hr Error Code. 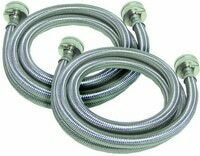 Check, Troubleshoot, or Repair: Connect the cold and hot water hoses hot to hot and cold to cold. Check, Troubleshoot, or Repair: Remove power to the washer for 10 minutes to attempt to reset the control board. After 10 minutes, plug the washer back in. If the code comes back then replace the control board. Check, Troubleshoot, or Repair: Remove power from the washer. Check wire harness connection on drive motor and control board. If the wiring connection checks good then the drive motor or the tachometer/hall sensor should be replaced. How to check the Hall Sensor on a Samsung Washing Machine. 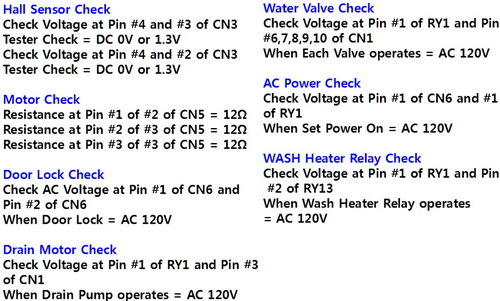 Check, Troubleshoot, or Repair: Check to see what water temperature the control board measures using Diagnostic test mode (see below). If the water temperature is increasingly different then replace the thermistor. Check, Troubleshoot, or Repair: There may be a shorted circuit to motor or PCB. Check power supply to washer, Go into Diagnostics Mode and or Test Mode (see below), Check main control board, Check main drive motor. In certain instances you may need to put the Samsung washer into Diagnostics Mode. You can check what error codes have previously occurred using this mode. On most Samsung front loading washers you enter diagnostics mode by Pushing the “Signal” button and the “Extra Rinse” button. Push the “Spin” button and when “d” is shown on the display panel, turn or jog the dial in a clockwise or counter clockwise motion and you can then see error codes that have happened recently. Hall Sensor, Water Valve, Motor, AC Power, Door Lock, Washer Heater Relay, Drain Motor. 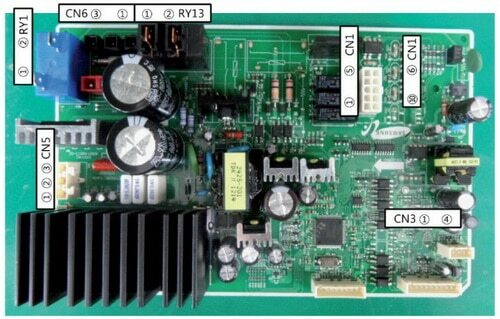 Check the Voltage or Resistance of parts from the pins on board. 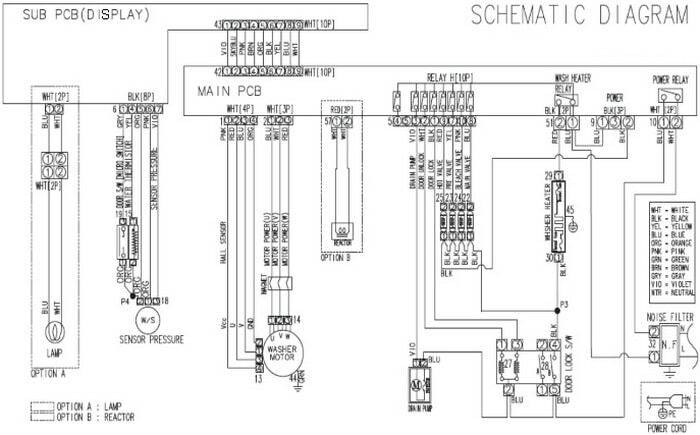 SUB PCB (DISPLAY), MAIN PCB Board & Components Schematic. Check AC power supplied to Main PBA. Check DC power supplied to Sub PBA. Check the power supplied from PBA. Samsung Front Load Washer Troubleshooting Error Codes, Diagnostics Mode, Circuit Board Schematics. Troubleshooting Vibration & Noise, Water Leakage, Water Supply, No Power, Improper Operation, Mode Error, Test mode / Diagnosis, Circuit Diagram / PBA. my front load washer is not working during the first cycle, a funnel symbol showed instead of code. I would be appreciate if any suggestion that I can do ! Previous post: All My Garage Door Openers Have Stopped Working – What Can Cause This? Next post: Dishwasher And Garbage Disposal Are Both Not Working – What To Check?